This bracelet was tatted by Michele Merrill. It is made from a pattern called Bracelet by Jennifer Williams. Very simple and fun to make. Tatted in Lizbeth #20 in Antique Violet. 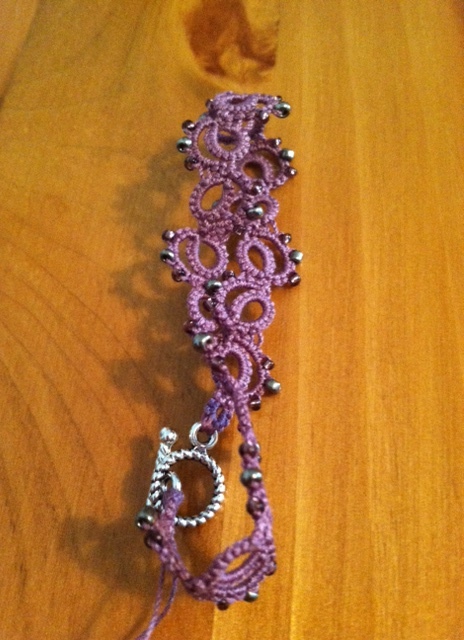 This beautiful violet bracelet was tatted by Michele from a pattern called “Bracelet” by Jennifer Williams. Michele did a very lovely job with it and I look forward to seeing it in person soon. Thanks for sharing your bracelet with us Michele! This week’s pattern was created by Nancy Tracy. It is an adorable little hedgehog. Make sure you check out Nancy’s other wonderful patterns. We have featured three other patterns of Nancy’s as previous challenges: #5 – Pretty Tatted Kitty , #9 – Tatted Snail, and #12 – Clover Drop Heart. Hedgehog designed by Nancy Tracy. Tatted by Natalie Rogers with bead selection by her youngest sister. Challenge Accepted – Reader Submission for Weekly Challenge #1 – Butterfly – Tatted by Bethaney Rogers. Challenge Accepted – Reader Submission for Weekly Challenge #3 – Triangle Motif – Variation tatted by Bethaney Rogers. Challenge Accepted – Weekly Challenge #17 – Tatted by Marie McCurry in Lizbeth, size 20, dk. purple. Challenge Accepted – Reader Submission for Weekly Challenge #18 – Hedgehog – Tatted by Terry. He looks adorable! Challenge Accepted – Reader Submission for Challenge #18 – Hedgehog – Tatted by Marie McCurry in Lizbeth, size 20, black, med brown fudge, and mocha brown. Little Owl Earrings designed by tattabugg and tatted by Michele Merrill. 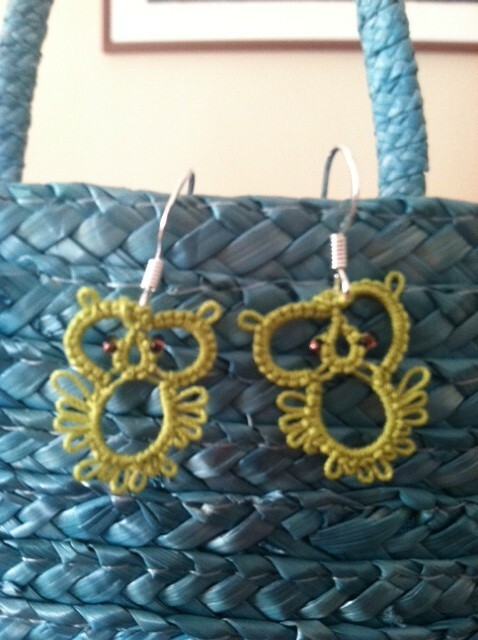 These are owl earrings made from tattabugg’s “Little Owl Earrings” pattern. Michele used Lizbeth thread size 20. You can find the pattern in the members forum on InTatters here: http://www.intatters.com/showthread.php?2022-Little-owl-earrings. These are adorable earrings! The split ring is a wonderful little technique and is used in a variety of patterns. It is most useful for creating one ring directly next to another in a pattern or for stepping up out of a round. The first pattern I tackled that used split rings was Anne B’s Minor Norwegian Dragon (featured as Weekly Challenge #2). Please let me know in the comments if you have a link to a tutorial for split rings that is not mentioned here or if you have a request for a technique you would like to see featured. Thanks! This page contains only split ring (SR) tutorials. A tutorial page for Single Shuttle Split Rings (SSSR) is planned in the future. Split Ring Tutorial by Linda Davies – This YouTube video features audio instruction for two different hand positioning methods to achieve the split ring. This is the first time I have heard of the “dead spider” method. She explains the process well, but the camera is too far out to see the individual stitches. [Contains background music]. Frivolite-Tatting Lesson 12 – two-shuttle split ring by Karen Cabrera – This YouTube video features text instructions and close up video of the two hand positioning techniques for the split ring. [Video is silent]. Tatting – The Split Ring by 11 Frivole – This YouTube video features text instructions and close up video of the “dead spider” method. [Clock/metronome can be heard the entire video]. Tatting a Split Ring by tatmantats – This YouTube video features audio instructions and close up video of the “dead spider” method. Tatting – Split Rings (SR.) in Needle Tatting by RustiKate – This YouTube video features a needle tatting split ring tutorial. I have never tried needle tatting. She is very good at explaining her steps, but I would prefer she move slower during the actual demonstration of the technique. I would also be worried that I would forget to re-thread the needle. [She tats very quickly]. How to make a Split Ring by Jon Yusoff – This tutorial blog post features step by step pictures and text directions of the “dead spider” split ring process. Two-Shuttle Tatting: Split Rings for the Terrified by Williams Daniel – This article shares a bit about the history of the split ring in addition to giving written instructions for the split ring for both needle and shuttle tatters. 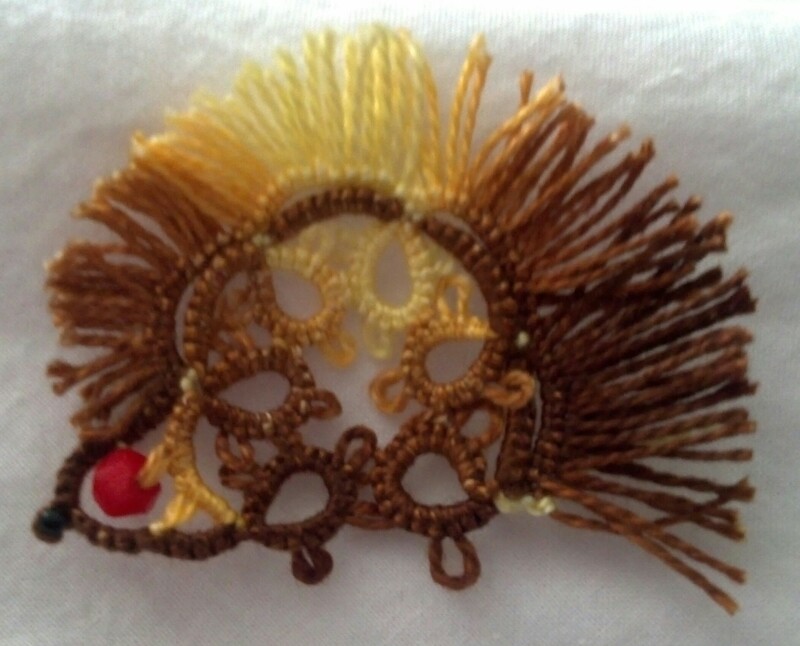 We are now accepting teacher applications for our 18th Annual Tatting Days and Workshop, April 25-26, 2014. Our theme this year is “Tatting in Bloom”. For more information, click here. The teacher application is located here. I am really looking forward to our next workshop and can’t wait to see the lesson choices offered. You can read about my experience from last year’s workshop here. I’m the type of gal who likes to jump into things feet first and fully immerse myself in a new hobby. So here I am, a year later, looking back at how far my tatting has come. One year ago today, I took up my first shuttle. In fact, it was a year ago today that I learned about tatting. I’m sure some of the lace I have seen over the years used the technique, but I didn’t know what it was and would have, at that point, just assumed it was a form of crochet or knitting. My tatting in the first few days, August 2012. Natalie’s first attempt at tatting. I am so happy that I know what tatting is now. I am very grateful to Donna for taking the time to teach me the basics on the first night and then for having the patience to teach me new techniques as the year went on. I love tatting. It has easily become my favorite form of crafting. I’m very enthusiastic about tatting, as many a person who has asked me what I am doing has found out. 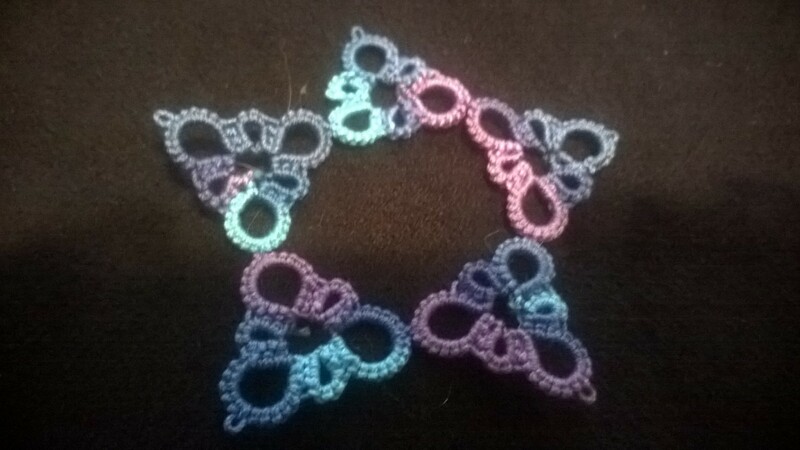 I’ve introduced several people to tatting over this past year (thirteen of whom sat with me for a basic lesson or more) and even taught the basics to several. My sister-in-law is my newest student. I taught her the basics during her recent visit and she is already reading patterns and completing motifs. Bethaney’s first tatting from patterns. She was taught on August 12, 2013. Tatted by Bethaney Rogers. This was the first pattern she followed. Tatted by Bethaney Rogers. This was the second pattern she followed. It is always exciting when the basics just click for a new tatter. I have the utmost adoration for any tatter that sticks with it and I’m proud of those that gave it a try. I have had a blast demonstrating at the Fall Folk Festival (as a newbie) and then at the Historic Skills fair. Things tatted at the Shuttlebirds Guild Workshop, Guild Meetings, or made for the Theme Contest. I consider myself very lucky to be a member of the Shuttlebirds Tatting Guild. I’ve been taught several techniques at guild meetings and everyone is so friendly. I also really enjoy seeing all the various projects that other guild members are working on. Between that, InTatters, and Pinterest I have an ample stream of tatting inspiration. When I first started tatting – I did all sorts of things to improve my skills. When I thought I had things down well enough, I decided to imitate some brilliant designers and try to tat a few of their designs just by looking at pictures. I also played around with various jewelry designs and had fun making tatted gifts for several family members. Happy Accidents and Tatting Experiments. 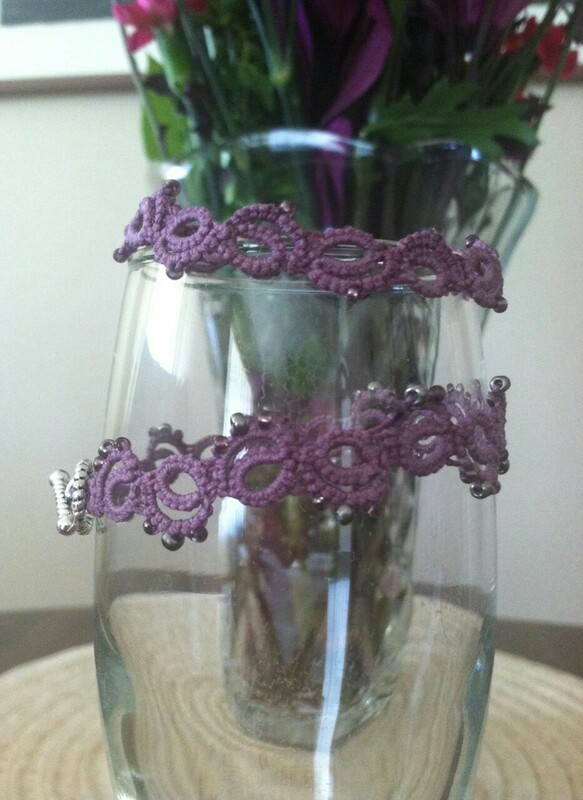 Hairpin lace and tatted bracelet. Sweetheart Snowflake pattern variation by Natalie Rogers. Original pattern is Gina Butler’s garter. This snowflake variation is shared with permission from Gina. 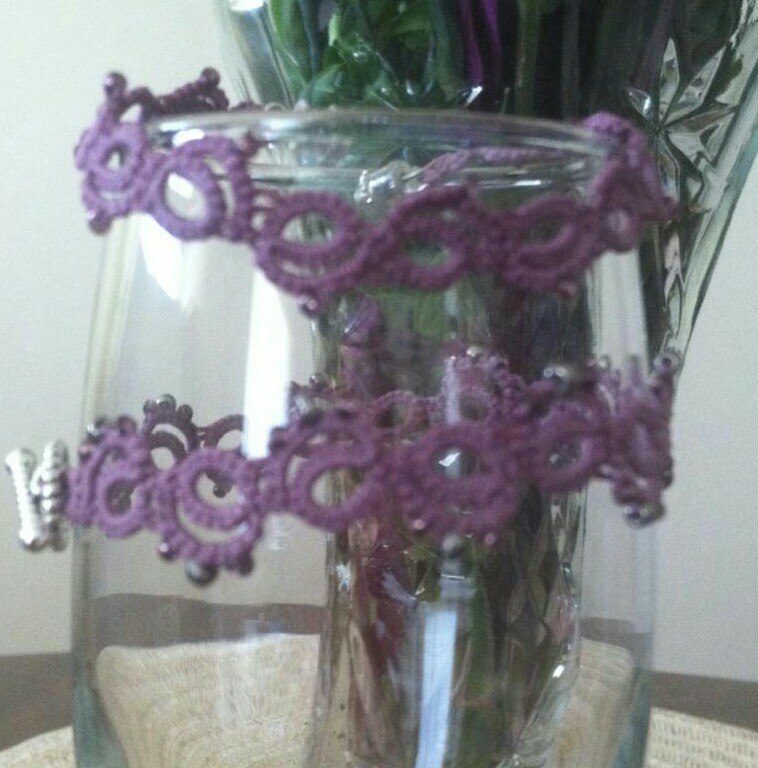 Hairpin lace and tatted bracelet. Tatted and designed by Natalie Rogers. I made this one for my Nanny June when she visited from Australia. I arrived at an accidental heart pattern from a mistake while trying to follow an antique pattern. 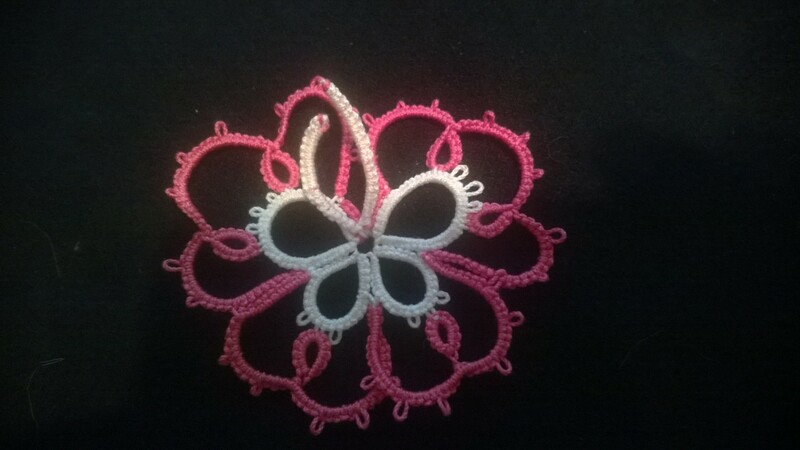 I arrived at a snowflake pattern while tatting Gina’s lovely Wedding Garter pattern. I’ve even toyed with combining tatting and hairpin lace (thank you Donna for teaching me that too!) into a bracelet and liked the result. Snail designed by Nancy Tracy. Tatted by Natalie Rogers in Lizbeth thread size 20 and color Elderberry Jam (#177). Even the back of the motif looks pretty! 5 Point Celtic Motif tatted by Natalie. Lizbeth thread size 40. Round 1 color Purple Iris Fushion (162). Round 2 & 3 colors Pink Blossoms (176) and Peacock Blues (149). Blue ribbon – before genders were found out. Yarnplayer’s Remembrance ring tatted by Natalie Rogers. Lizbeth thread size 20 color Jewels (113). Challenge Accepted – Reader Submission for Weekly Challenge #7 – Variation of Gina Bea’s Wedding Garter Pattern. Variation created and tatted by Natalie Rogers (I’m allowed to accept my own challenge, right?). Tatted in Lizbeth size 20 and colors Niagara Falls and Elderberry Jam. This is mock 1 of the variation. I’m currently working on a draft 2 that fixes some things. Morgan Mouse pattern designed by Wanda. Tatted by Natalie Rogers in Lizbeth thread color Jewels (#113) and size 20. 5 Point Celtic Motif tatted by Natalie. Lizbeth thread size 40. Round 1 color Purple Iris Fushion (162). Round 2 & 3 colors Pink Blossoms (176) and Peacock Blues (149). Booties on display (one of them still needed another roung at this point. Completed bootie (minus tail tuck). I followed Gina’s suggested variation of removing one of the 4-1-4-4-1-4 rows to fit the elastic I had purchased. I used Lizbeth thread size 20 color 158 (Niagara Falls) thinking of “…something blue.” The photo album in the background features my wedding cake which my sister-in-law made. Triforce tatted by Natalie pictured with Master Sword and shield. Butterfly tatted by Natalie Rogers. Jane Eborall’s Small Motif pattern tatted by Natalie Rogers. I started the pattern in a size ten and realized that I wanted to use a smaller thread. So I turned it into a bookmark. One of the dragons I tatted likes to hang out on my necklace. My cat, Kaylee, wondering why she can pose with the mouse, but isn’t allowed to play with it. Tatted Cameo Pendant designed by TotusMel. Tatted by Natalie Rogers. Lizbeth size 3 in color Purple Splendor (129). Clover Drop Heart designed by Nancy Tracy. Tatted by Natalie Rogers in Lizbeth size 20 and colors Niagara Falls and Elderberry Jam. Keagan’s foot modeling a completed bootie. Blue ribbon – before genders were known. I have had an amazing time challenging myself with a new free pattern each week and in turn challenging you, our readers. I really love doing the weekly challenge posts (even if over half of them have been tatted the night before in a panic). 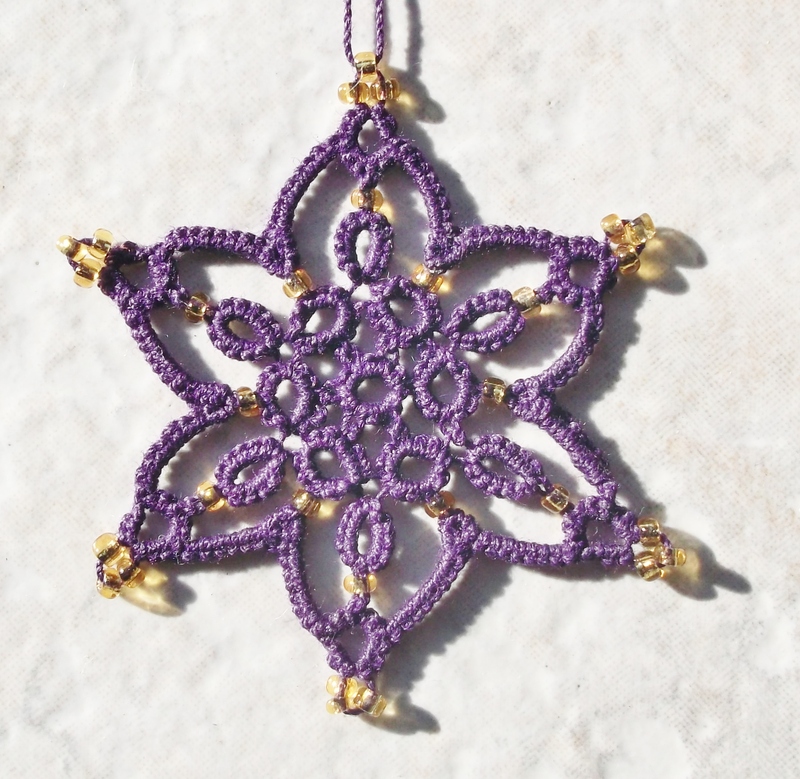 I am grateful for the wonderful tatting designers who have granted permission to link to their wonderful creations. I am also thankful for the readers who have accepted the challenge and sent in pictures. 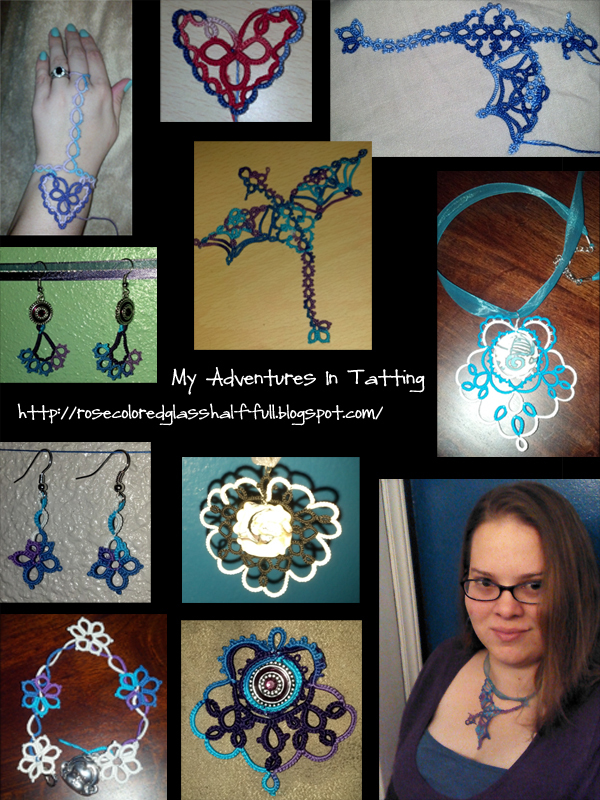 Your pictures inspire me to keep on tatting and make writing for this blog something I look forward to. Thank you! Tatting done by Joyce and given to me as part of the tatting exchange! I love it all! Another tatting highlight for me this year was participating in the “These are a few of my favorite things…” exchange on InTatters. I’ve made a delightful new friend who sent me a bunch of neat stuff including some amazing tatted pieces (pictured above). I will add pictures of what I sent her after she receives it (hopefully by Monday). I’m incredibly fascinated by the tatted doily bowl. She even shared the process for turning a doily into a bowl – I will definitely be trying this in the future. My drive to learn new skills was initially to achieve the goal of completing Anne B’s dragon pattern. I’m happy to say that I’ve made a few of these guys over the course of the year and will make several more in the years to come. My husband has also been very supportive of my new hobby. He spoiled me on our anniversary with a beautiful wooden shuttle and more thread (pictured above). There is no way I could have enjoyed this hobby and done so much in a year without his love and support. Thank you Bevan! 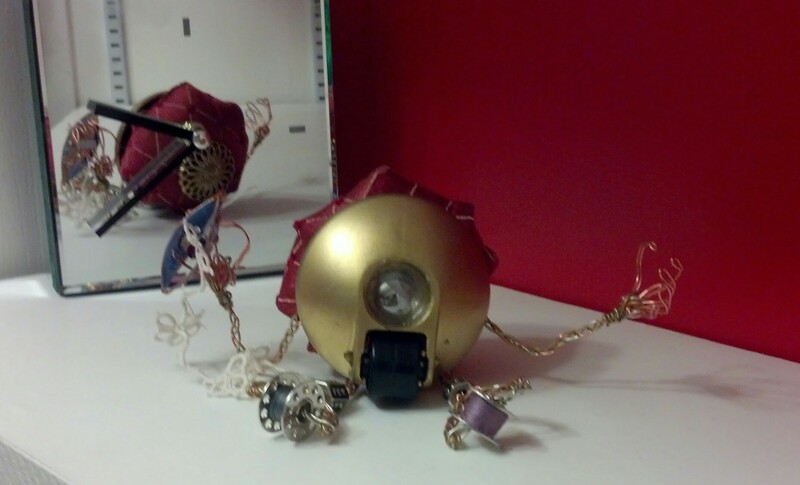 Meet T.A.S.C., my Tatting And Sewing Clank. I hope you enjoyed my rambling self-reflection and I’d love to hear what you think about anything I’ve shared in the comments. This week’s pattern was created by Jane Eborall. It is a lovely flower motif and I have fallen in love with it. If you look to closely at my picture you will find my mistake. Personally, I think it turned out beautiful, but I could be biased as it was worked up in my favorite color and now I look forward to fall. Be sure to check out Jane’s other amazing patterns! It can lay flat (especially if you don’t make my mistake of adding extra stitches), but I liked the way it was naturally curving. I hope you have as much fun with this pattern as I did. I hope to see some reader submissions next week! I love seeing what everyone tats!